Every year in Marlborough, MA, generally in May, July and Nov is the International Jewelry and Gem Show. I used to stock up on gemstones from this trade show long ago in the '90s, but I stopped going to the shows for a fquite a few years. Last year I came back and bought some pearls and unusual beads. Today I went down to the gem show, and it was pretty empty. It used to be so packed, it was hard to move or get someone's attention to buy, and I think I stopped going. Must be the economy but the crowds are not there anymore and it was easier to shop. The vendors were overheard saying the customers are not coming anymore. This time, I stuck with beads and some turquoises. I must be "pearled" out but I didn't get any pearl strands. I'm moving away from using pearls as "chains" or neckrings to hang my pendants on. Sometimes using a silver chain is too plain, and too boring, so using a colorful strand of pearls or beads can perk up a silver pendant. 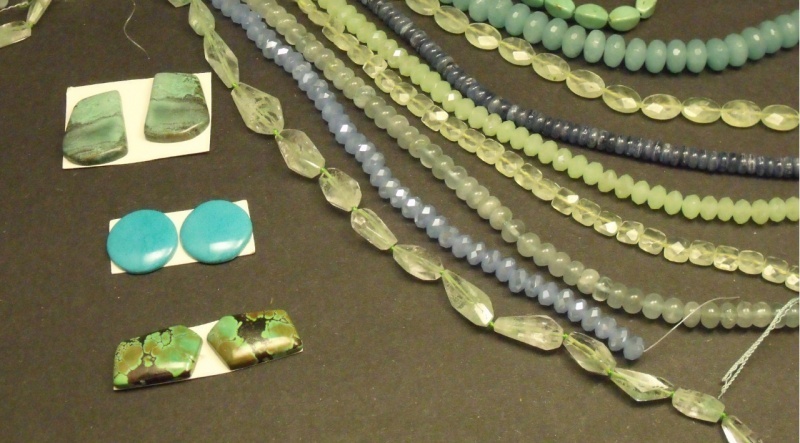 I found myself drawn to the faceted rondelles as you can see above in glass, prehnite, aquamarine, kyanite and turquoise. I'm finding myself moving up to faceted beads for a more upscale look. I hope to have most of these beads made into necklaces for the Annual Craftsman's Fair in a few weeks from now, so if you come to the fair, stop in my booth in Tent 4, booth 409 and see what creations I came up with. I never quite know what I will end up making. That's the fun thing about making jewelry.